To my fellow twenty-somethings: Do you consider yourself entitled? I ask because Time Magazine is calling us the “ME ME ME” generation. …and that pisses me off. The common line of thought is that our generation wants more than we “deserve,” that we’re not willing to work for it. Our elders compare us to generations of the past. We don’t have any grit or follow-through, they say. I want to challenge that idea. I want to challenge the idea that we’re entitled. I want to challenge the idea that we think too highly of ourselves. I don’t think we think of ourselves highly enough. We can’t go to school, get a Bachelor’s degree and immediately find a nice job that’ll coast us through the next 40 years. We can’t depend on big companies to take care of us. We can’t expect to be given benefits or a pension. Hell, we can’t even expect our resumés to be read. Do you know of any factory job that could possibly provide for a family of 4 kids?! We have to learn a new way to operate in a world in which things are always changing. It’s a different type of hustle now. Allow me to introduce you to the Three New Truths. 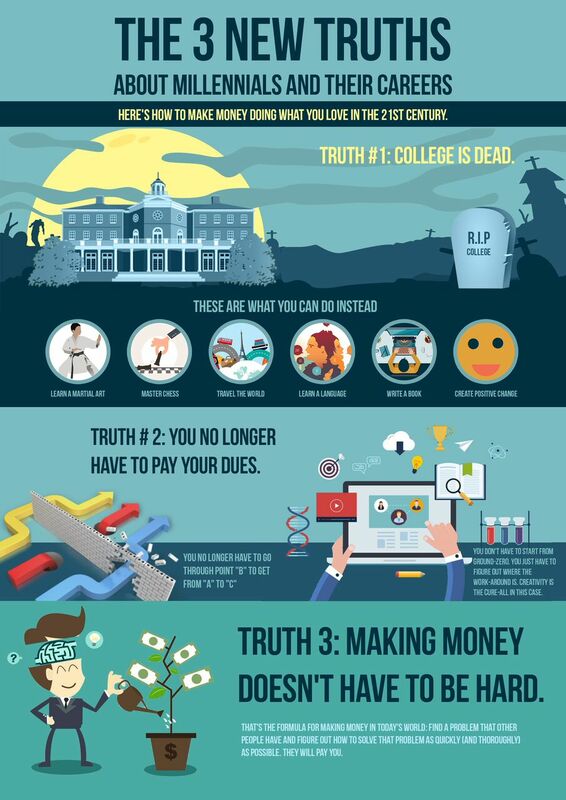 Truth #1: College is dead. If you’re really interested in a certain subject, you don’t have to go to college for it. You can read 20 to 50 books on the same subject, get just as much out of it, AND pay $100,000-200,000 less. Figure out what’s meaningful to you and then pursue that—aggressively. You don’t need to be in the confines of a university to find your calling. Start a meaningful project instead. It really doesn’t matter. The point is, it’s up to YOU. Truth # 2: You no longer have to pay your dues. This is going to make some people very angry. We’ve all heard about the struggles of earlier generations. We’ve all heard about the honor of paying your dues. Everyone’s grandpa walked uphill to school in the snow–both ways. Look, there’s a lot to be said for working hard… but I personally don’t see any honor in inefficiency. With the speed of the Internet and the way industries are moving, things are happening quicker than ever before. You can gain traction a lot faster now. Wasting years waiting for someone else to give you your big break just doesn’t make sense. I created my a massive following by writing a ton of content and giving it away for free. I wrote about my experience as a frustrated twenty-something who knew there had to be more to life than the nine-to-five. I found an audience who resonated with my message—or rather, they found me. Now I teach people like you how to build businesses using skills you already have. I’m not a ‘teacher’ in the traditional sense. I didn’t go to years of schooling for that. I made a career for myself that didn’t exist. I effectively skipped B to get from A to C.
Here’s the point: You don’t have to start from ground-zero. You just have to figure out where the work-around is. Creativity is the cure-all in this case. Truth #3: Making money doesn’t have to be hard. You shouldn’t have to agonize over making money. No one ever said you had to suffer first before being wealthy and living a fulfilling life. When you’re a kid and you’re learning how to ride a bike, do you care if the person teaching you is a professional cyclist? Do you ask if they placed in the top ten at the Tour de France? It’s OK to have your goofy uncle Gerald teach you how to ride a bike. He might not be a world class cyclist, but he’s better than you! And he can teach you. That’s good enough. THAT’S the formula for making money in today’s world: Find a problem that other people have and figure out how to solve that problem as quickly (and thoroughly) as possible. They will pay you. That’s how we all have to start thinking about making more money. It’s not about being an expert all the time. It’s about becoming an expert over time. Your work becomes an expression of your personality. That’s what I call fulfilling. This is a controversial way of thinking. I don’t want you settling for less just because that’s what most people have been doing for years. I’m challenging preconceptions. We all have them and they aren’t serving us. Not anymore. Let’s throw them away. Here’s a really cool infographic for you summarizing The 3 New Truths. Click here to grab that!